This week’s Triple Shot drags you into the cold depths of writer’s block, teams up the World’s Finest and concludes the two-year storyline orchestrated by Bullseye over at Daredevil #27. TYRANNY OF THE MUSE #1 is a bizarre existential tale of writer Frank Fisher reliant on a perennial injection of a mysterious substance that fuels his creativity, perhaps his soul. The muse is his girlfriend, purveyor of the stuff, delivered shots into a festering wound on his head. Our protagonist is also addicted to crystallized iced tea and coffee, apparently. 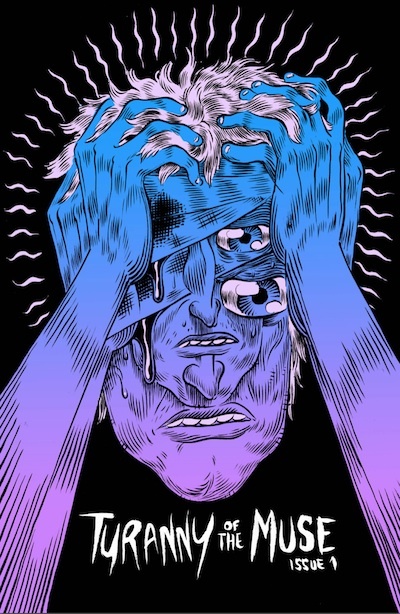 For fans of outside-the-box indie comics of Dash Shaw, Charles Burns, Peter Bagge and Robert Crumb, the artwork has an uncomfortable tension of a fever dream on the realm of the subconscious. For those of us staring at white pages and blinking cursors daily, the fright of a writer’s block could send you off of the deep end. What price might you pay to make it go away? What is most disturbing is the festering wound on his head, constantly begging for more juice as the days go on. This is a story about co-dependence, anxiety, addiction and sickness. You might feel uncomfortable reading this book, and if you do, I think that’s the point. Dig into it and coast on the weird! 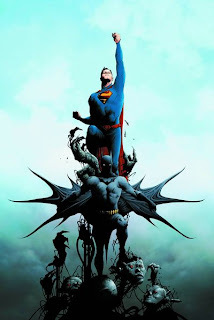 Batman/Superman #1 recreates the classic World’s Finest orSuperman/Batman title for The New 52, with a killer team of Greg Pak (World War Hulk) and Jae Lee (Namor, Dark Tower). Teaming up the Man of Steel with the Dark Knight outside of the Justice League is certainly nothing new, the balance of the two characters is more of a tense and interesting dynamic than say Wolverine and Captain America or Spider-Man and Ice-Man. The godlike nature of the heroes makes for more of a compelling story. The art is knockout amazing from both Jae Lee and Ben Oliver. The art switch is in service of the story (a different setting). I especially appreciated Jae Lee taking a new approach to his panel layouts, like we have seen recently in the Batwoman book ( J.H. Williams, Trevor McCarthy). Ben Oliver’s art is more organic and well illustrated in contrast to Lee’s more painterly lines and organic drapery. My favorite panel is Pa Kent holding Clark by his suspenders, literally saving a kitten for Lana in a flashback. On to the story, and spoilers after this point. This version Superman and Batman seems to be set in the ‘5 years ago’ timeline of The New 52 (Superman in jeans, Bruce Wayne on his Army jacket recon missions a la Year One). It gets confusing, and sure to be cleared up next issue, but Clark is teleported to Earth 2…perhaps? Not sure but Pa Kent, presumed dead according to New 52 continuity makes an appearance. Either way, the story will reveal itself, and it is great to see these two main creators working on this title at DC. I’m on board, this will make up for me dropping both flagship titles that don’t interest me much anymore, Action Comics and Detective Comics. 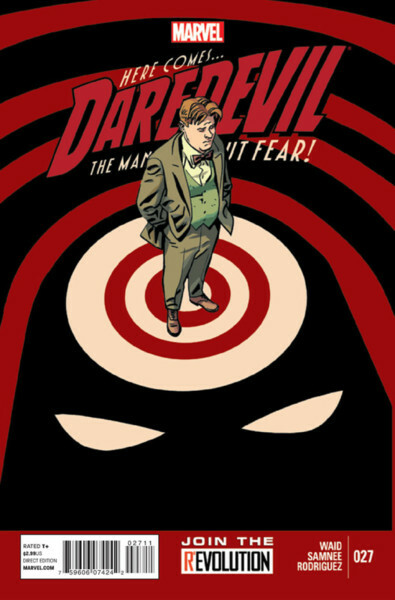 Clearly one of my favorite titles, referenced if not picked here at TRIPLE SHOT is Daredevil by Mark Waid and most of the time with art by Chris Samnee. This issue marks the end of the road for this particular storyline, being built up since issue #1. Waid sure can wrap things up nicely — even with a 27 issue slow burn. We have appreciated this new version of Daredevil, that doesn’t turn grim and gritty, but has some humor but mostly a positive or go with the flow attitude from Matt Murdock. Early on, we were treated to a new canonical way of illustrating Matt’s radar sense, and action scenes took full advantage of his powers. As is the way with Daredevil, his personal and professional life start to fall apart. He’s fought The Spot, Stilt-Man, Mole Man, Klaw and so many more these past two years. He’s lost his firm and his practice, his secret identity and his best friend Foggy is battling cancer. It has come to be revealed that this all has been masterminded by his old enemy, Bullseye who was presumed dead but has been kept alive in an iron lung, resuscitated by The Hand, who were not able to repair his spine. Daredevil fights off Ikari while Bullseye reveals his plans to Daredevil from his iron sarcophagus. Luckily, Daredevil has protected his loved ones with bodyguards ranging from Iron Fist to Ant Man, Black Widow and Spider-Man so they are safe from The Hand during this final battle. It is no surprise that Daredevil is victorious over the weakened Bullseye but this was not without some cost. A fearless Daredevil swings into the night after relaying the story to the recovering Foggy. 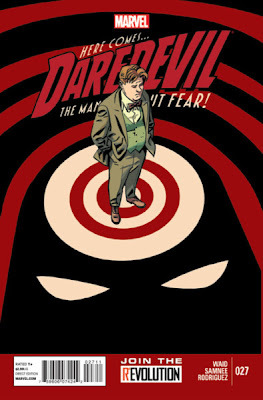 I can’t wait to embark on new Daredevil adventures after this, it is hard to believe this book has been so consistently awesome for two years running already. The trade paperbacks or ComiXology collections of these books are top of the stack recommendations to Daredevil or non-comic book fans. Great writing and art, and not bogged down by gloomy emotions from years of the character’s history.